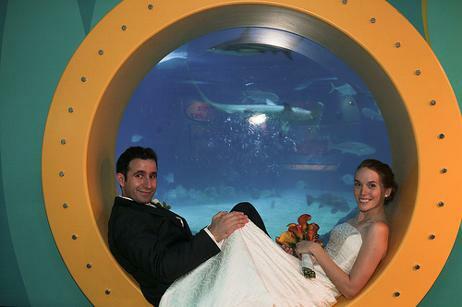 Located in the lagoon at Key Largo Undersea Park, Jules' is the world's first underwater hotel! In addition to overnight stays in the Lodge, the Park offers a great SCUBA training location in its Lagoon, with a depth of up to 30' in a protected setting. Individuals can get Open Water certified here, do a Discover SCUBA Diving course, or just dive around in the lagoon. 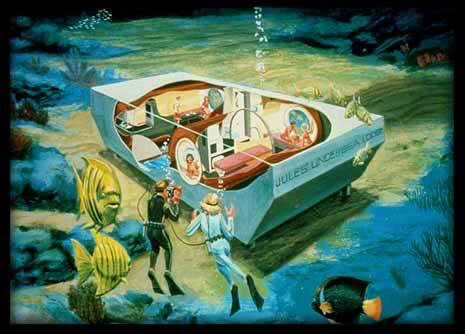 The entire structure of Jules' Undersea Lodge is underwater, sitting up on legs approximately five feet off the bottom of the protected lagoon. The Lodge is filled with compressed air, which prevents the water from rising and flooding the rooms. A five by seven foot "moon pool" entrance in the floor of the building makes entering the hotel much like surfacing through a small swimming pool. Divers find themselves in the wet room, the center of three compartments that make up the underwater living quarters. The wet room, as the name implies, is where divers leave their gear, enjoy a quick hot shower and towel-off before entering the rest of the living area. Designed for comfort, the air conditioned living space has two private bed rooms and a common room. The eight by twenty foot common room is a multi-purpose room providing the galley, dining and entertainment areas. Each of the bedrooms and the common room is equipped with telephone, intercom, VCR/DVD and our latest addition of the, "I Home", so you can enjoy your own choice of music from home. But the main focus of attention is the big 42 inch round window that graces each room. "Waking up to view a pair of angelfish looking in your bedroom window is a moment you'll never forget"
Jules Undersea Lodge is pleased to offer members of the U.S. Military a courtesy discount of 10% with presentation of appropriate ID. 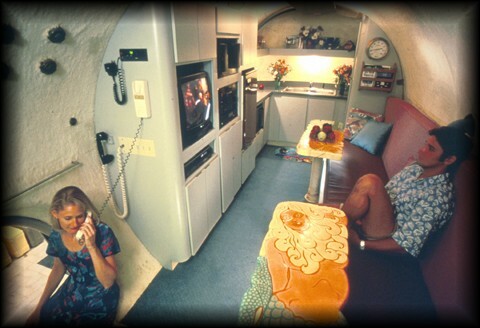 Cancellation policy: Because Jules' Undersea Lodge has only two rooms, we strictly adhere to the following policy: There is a 50% refund of your deposit 30 plus days prior to your reservation date. No refund 30 days or less of your reservation date. You are always able to reschedule your reservation date with a fee of $50.00. If there is an evacuation in the Keys due to weather you will be able to reschedule your stay without having to pay a rescheduling fee. Gift Certificates are transferable not refundable. If you are not here by 5:00 p.m. and you have not called to inform our staff that you will be late for your normal check-in-time, your reservation will be cancelled and there is no refund. If you are diving as a certified diver and you arrive without your certification card there will be a $35.00 verification fee and if we are not able to confirm your certification you will have to take the Discover Scuba Course.